This will be my family's 4th Christmas on a super strict budget, so you could say I know a thing or two about buying thrifty + frugal presents. First of all, let's make sure you have a Christmas Budget set up! Grab my FREE Printable Family Holiday Budget Planner to get yourself organized + read more about Planning for Christmas on a Budget in Part 1 of this Blog Series! 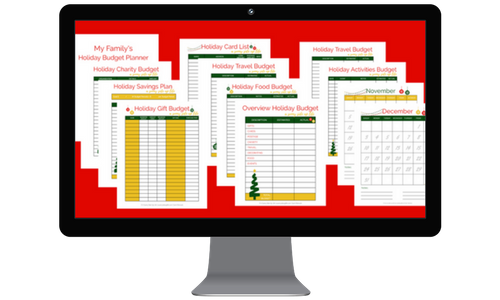 After you've downloaded my FREE Printable Family Holiday Budget Planner, you'll want to write out a Gift Budget for each person on your list, and then brainstorm a few gift ideas for that person. Feel free scratch through + edit these numbers or gift ideas as you go to make sure that you're not over-spending on your Total Gift Budget. Please remember that if this is your first Holiday Season on a Budget that things might look a little different for your family than they did last year...and that's okay! That's why I'm here to walk with you through all of that! To be truly successful at following a gift budget I feel like you should pick one strategy per person and stick to it! For each person on your list you'll want to decide which strategy is best for them...and then run with it! 1. Goodie Basket or Group of small gifts that are cheap while still being practical + fun. What you'll want to do with this strategy is buy several small + cheaper items, and then group them together in either a fun basket or use them as stocking stuffers. This strategy can work for really anyone on your list because who doesn't love receiving practical, but yet still fun gifts!?! Grab a basket (the plastic ones from Dollar Tree are my favorite) or another large container like a mixing bowl or a cookie jar. Add a few small items, some shredded paper filler (I also buy this at Dollar Tree), ribbon + other cute accents, and then about 5-20 items depending on the size + allowed budget. I love the idea of coming up with a theme for a basket to help you stay inspired while shopping...and I've listed a few of my favorite ideas below. Even if you don't decide to pick a theme you can still use this strategy! Simply gather up a group of items into a basket with a bow, a box filled with tissue paper, or use a traditional stocking. I've listed below a few of my favorite ideas depending on who you're shopping for. If you're going to only give one gift to someone I say make it count! Buy or make one really nice + thoughtful gift, wrap it beautifully, and then pat yourself on the back for not going overboard with too many presents! If you're on a really strict budget or you just have a ton of people on your list, then homemade gifts might be the route you need to take to keep that budget low! Consider making a bulk amount of whatever type of project you decide to do. For example, if you decide to type up a family recipes cook book then use that as several people's gifts and print multiple copies to save yourself some creative development work. Tap into one of your talents and run with it! Search Pinterest + YouTube for DIYs + How Tos to learn more. Whether you focus on cooking, painting, crafting, sewing, photography, or a talent you haven't yet discovered...don't be afraid to get your hands dirty + learn something new in the name of saving money! This is your time to grab a nice local boutique item, a specialty gift from an online store, or even that one super adorable thing from Target. Put some thought into it + remember that this gift can be mid-priced because you're only buying one thing! I feel like when in doubt...buy a gift card! Obviously put some thought into what the person loves, needs, or is interested in, but I'm a firm believer that gift cards can still be a thoughtful gift! Gift Card tip for success: My absolute favorite place to buy gift cards is Raise.com! Raise offers Physical + Electronic Gift Cards at a discount (make sure to pay attention to what type of card you're buying...eGift Cards can always be printed to be given as a gift). You can save tons of money by buying a gift card as a gift for someone on your list...or by buying them for yourself to shop with! This shopping tip alone saved me $87 last year! The third and final gift giving strategy is to determine ahead of time how many gifts you're going to buy. This way you'll not only be limiting yourself by your budget, but also by whatever number of gifts you've decided on. 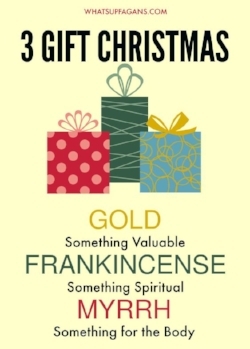 This will really help if you're normally someone who goes a little overboard with their gift giving. My favorite time to use this strategy is with my kids, because of course I'd LOVE to spoil them, but I have to stay focused and not get carried away. The two best examples of this strategy are with the "Something you Want, Something you Need, Something to Wear, Something to Read" rule or the "3 Wisemen" rule. For our kids we've used the "Something you Want, Something you Need, Something to Wear, Something to Read" rule for the gifts from us, and then we also give a few gifts + stocking stuffers from Santa. Whether you follow one of these, come up with your own, or just pick a random number of gifts that sounds good...the point here is to make a plan ahead of time + stick with it! Budget-friendly Gift Giving tip for success: Spend extra time on your wrapping + gift presentation to make your gifts look even more expensive. I love to stock up on white gift boxes from Walmart, add colorful tissue paper from Dollar Tree, trendy wrapping paper, plenty of ribbons, and a pretty tag. Think gift wrapping from a fancy department store + look up some inspiration on Pinterest.